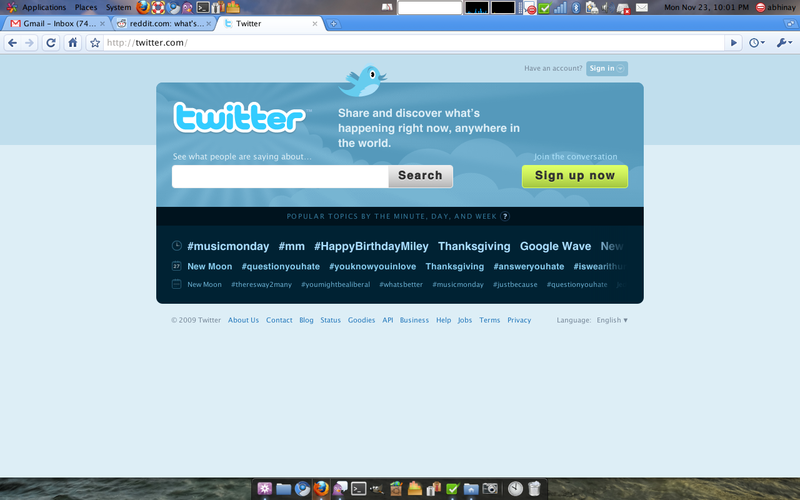 Yah, that’s my Firefox looking just like Google Chrome Browser! 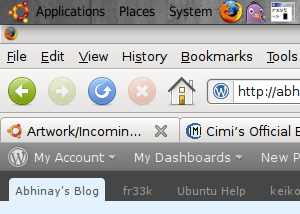 Running on Ubuntu 9.10 Karmic. 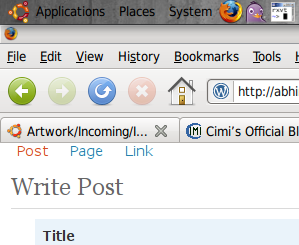 Simple – I used, Chromixfox, Total ReChrome to customize my Firefox to look like Chrome browser. Scrolling in Gmail is slow? But, I hope that this helps! We are cordially inviting you to attend the convention on “Freedom & Software”. The convention will be attended by IT Professionals, Academicians, Researchers, Entrepreneurs and Engineering Students. It was too annoying that i was not getting Deja Vu Sans Condensed font for firefox itself, whereas this font is working with other applications in Gnome. I was getting Sans font instead in Firefox. After gooooogling (too long) i got a workaround for this. Just add this lines to userChrome.css (create a new file if it is not there), create this file in ~/.mozilla/firefox/(profile)/chrome folder. 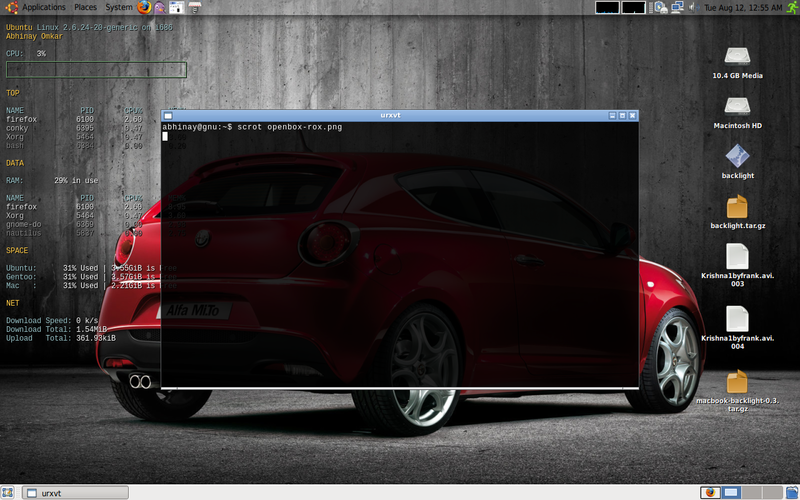 Openbox is lightweight window manager. I installed it on my gentoo, i really liked it. Openbox starts in blink of an eye my gentoo.Openbox just takes seconds to install in any distro. It comes around 500 Kb download size. I have been using GNOME environment in Ubuntu. I feel like GNOME is too slow in my system. I installed openbox and used with gnome session. It is really faster than complete GNOME session. You can change the session from the GDM option menu. Select, Openbox with GNOME session. You’ll get gnome panel, nautilus and other gnome apps with faster openbox window manager without losing the most of the gnome look & features. Openbox rocks !!! I’m gonna walkthrough the process of installing gentoo on other destro. It requires, patients, little bit knowledge about Linux. Make a separate partition for gentoo, you can do partition with gnu parted. In the my partition table you can observe that i have 10.4GB Free Space starting from 57.0GB to 67.GB. Where, gentoo is just a parition name, followed by start location and end location of the new partition. heh, gentoo parition is set. Lets, check with parted if the file system is successfully created. All set go, my gentoo parition is ready. By the way, you can use Ubuntu’s Swap parition for the same. Here is the Direct link : http://mirror.muntinternet.net/pub/gentoo/releases/x86/2008.0_beta2/stages/stage3-x86-2008.0_beta2.tar.bz2 ( as i said it is always recommended you not to use this link, get the latest version of stage3 tarball ). It’ll take a few seconds to extract. Read the tar manual page for tar options, Make sure you don’t miss any options from above. Download portage-latest.tar.bz2 file to /mnt/gentoo. Now enter into the new (Gentoo) Environment. Apply mactel patches to the kernel, if you are using MacBook. And the rest of the things are similar.